Maybe your cat's trying to tell you something as he burrows in your freshly laundered towels. This sweet kitty cave gives your furry friend a soft, comfortable place to hide, play, and sleep. Handmade by women's collectives in Nepal, this cozy cave is made from a textural blend of Tibetan and New Zealand wools. Handmade in Nepal. For regular cleaning, vacuum or spot clean with a sponge. If it becomes very soiled, turn cat cave inside out and wash in the delicate cycle of a washing machine. Do not put in dryer. Turn right side out, stuff with newspapers, and let dry. It's a favorite hiding place, it's the biggest cat toy!! It's made of heavy felted wool, so no synthetic fibers. Some mornings I find it halfway down the hall laying on it's side - I know the cats had fun the night before. This is a great product and looks like it will last forever, but I was disappointed in the size. None of my four cats can fit in this, not that they haven't tried. It is more for a kitten or young cat. However, they just flatten it out and lay on top of it. Have already returned this product because it's too small for a small to average sized cat. 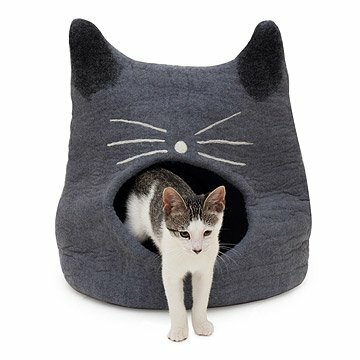 This sweet kitty cave gives your furry friend a soft, comfortable place to hide, play, and sleep.